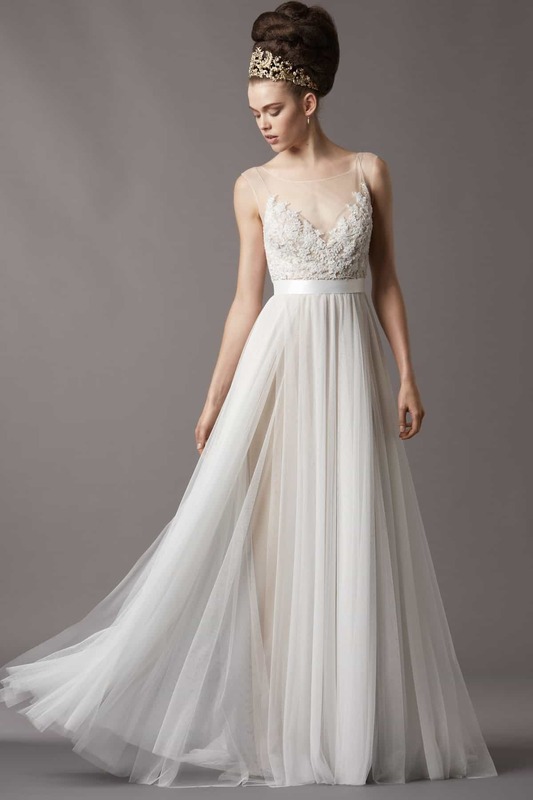 Jacinda Gown by Watters Bridal features hand-beaded soft netting and a stretch silk charmeuse slip dress underneath. Bateau Italian illusion net neckline with pearl buttons and loops to top of waist, double faced satin waistband covered with netting at natural waist and soft netting paneled skirt. This stunning gown features a romantic soft tulle skirt cut at floor length with a small sweeping train at the back. This brand new designer wedding dress is available to try on at The Barefaced Bride studio.